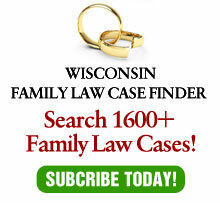 Earlier this month, the Wisconsin Court of Appeals issued one of the most … er … interesting decisions in family law in a long time. The opinion, written by Judge Ralph Adam Fine, is Heppner v. Heppner, from the District I court, No. 2008AP2020 (Wis. Ct. App. May 5, 2009) (recommended for publication). John and Susan Heppner were married in May 1974. They never had children. John filed for divorce in September 2006. Other than a few short-term jobs before and during the marriage, Susan had not worked outside the home, although she had a degree in geography. John contended that he constantly asked Susan to work outside the home, while Susan testified that John was OK with her staying at home. Susan’s health was poor. John had enjoyed a very successful career, but his job was very stressful and required significant travel, both domestically and abroad. Milwaukee County Circuit Court Judge Mary M. Kuhnmuench granted Susan limited-term maintenance (four years, in a 32 year marriage!) to end when John turned sixty on May 30, 2012, irrespective of whether or not he had retired. In addition, the trial court excluded income from John’s stock options that he would exercise after the divorce in determining the amount of John’s maintenance obligation to Susan. Finally, the trial court awarded John stock options, which grant price exceeded the value of the stock as of the divorce because the court found that they had no value. First, Susan contended that the trial court erred in deciding that maintenance should end when John turns 60 on May 30, 2012. Under Hefty v. Hefty, 172 Wis. 2d 124, 493 N.W.2d 33 (1992), the recipient spouse is entitled, assuming that the payor spouse’s income permits it, to enjoy his or her life at the standard that he or she could anticipate enjoying but for the divorce. The Court of Appeals found that by ending maintenance on May 30, 2012, the trial court ignored the Hefty principles and erroneously exercised its discretion. If Susan is to be able to enjoy the life she would have enjoyed if the parties had not divorced, as Hefty teaches is the rule, she is entitled to maintenance even though John is retired. If circumstances change so that the 50/50 split of John’s income is no longer fair or warranted, the parties may return to court for a modification. Accordingly, the appellate court, under Wis. Stat. § 808.09, modified the trial court’s maintenance order to extend beyond May 30, 2012, for an indefinite term. Second, Susan argued that in setting the income pool from which John would pay maintenance, the trial court improperly excluded those stock options that he would exercise after the divorce. Under Wisconsin law, the trial court is obligated to consider all sources of income when establishing maintenance. In this case, the trial court held that John’s stock options were property, not income. However, the Court of Appeals found that much of John’s income from his employer over the years had been from stock options, not traditional salary. The trial court gave no reason why such a significant component of John’s income should not be included in the income pool for the payment of maintenance. Further, there would be no improper double-counting because the principle that prevents double-counting of an asset for both property division and maintenance does not apply to income from assets awarded in a property division. As a result, the Court of Appeals held that the trial court’s refusal to include stock-option income in the pool for maintenance was an error of law and, accordingly, an erroneous exercise of discretion. Thus, the appellate court exercised its authority under Wis. Stat. § 808.09 and modified the trial court’s maintenance order to encompass the income that John receives from the exercise of the stock options. Finally, Susan contended that the trial court erroneously exercised its discretion in refusing to divide as part of the marital settlement agreement those stock options that the trial court viewed as having no value as of the time of the divorce because they were “under water.” Under Maritato v. Maritato, 2004 WI App 138, 275 Wis. 2d 252, 685 N.W.2d 379, if the exercise price is less than the market value, the option has no value. But, it is still within the trial court’s discretion whether to include underwater options as part of the marital estate. The Court of Appeals found that the trial court erroneously exercised its discretion by excluding the options from division because it erroneously viewed their potential value as being almost solely a function of what John would do in his business after the divorce, and largely ignored the fact that the options were earned while the parties were married. Accordingly, the Court of Appeals reversed the judgment insofar as it did not make a property division of the underwater options, and remanded this matter to the trial court so that could be done. The case raises numerous questions and potential consequences for future divorce actions. Next week, I will discuss these questions and potential consequences. For now, let’s just say that the case provides a veritable cornucopia of controversial issues for discussion – a columnist’s dream!